What’s In the Approved Fiscal Year 2019 Budget for PreK-12 Education? Per-student funding up by 3.9 percent (to $10,658), but still far from Adequacy Standard ($11,600). 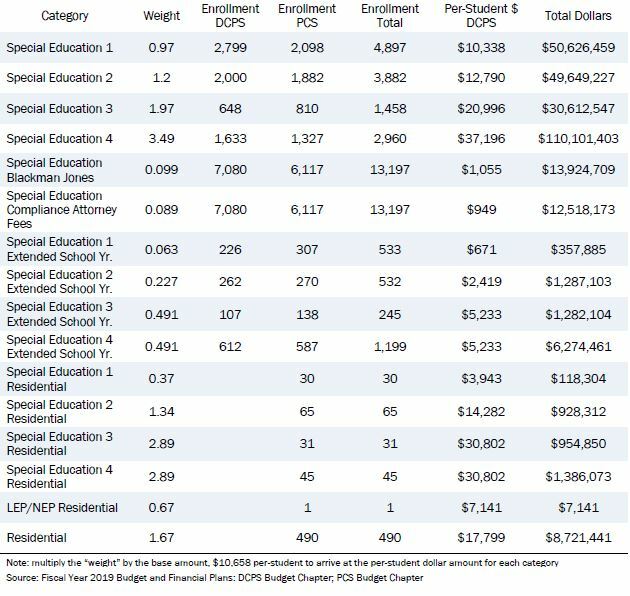 Only 60 percent of DCPS school level ‘at-risk’ funds in FY 2019 initially allocated for supplemental supports for low-income students, 40 percent unaccounted for. Critical investment of $10.6 million new dollars for Out-of-School-Time programs. Fully funded 2014 special education reforms. Mental health supports in schools up by $3 million. School nurses supported with $4.4 million increase. Increase of $1.4 million for Community Schools, which build partnerships to address neighborhood needs. The non-residential facilities allotment for public charters increased by 2 percent to $3,263 per student. The FY 2019-2024 capital budget outlines $335 million for capital projects in DCPS in FY 2019. The approved fiscal year (FY) 2019 budget includes essential investments to make school funding more adequate and more equitable, as well as historic increases inside and outside the classroom: in special education, out-of-school-time programs, restorative justice approaches to student discipline, and community-school partnerships. Despite these improvements, however, our city’s investment in public education is still far less than what is needed to support every DC student on the path to success. The approved budget increases school funding beyond what was needed to cover the new teacher contract, but still falls short of giving all students the resources they need to succeed. Since the publication of the 2013 DC Education Adequacy Study five years ago, the amount of funding per student has consistently been lower than recommended. This year’s increase brings us closer than we have ever been, but we are still $942 per student, or 9 percent, short (Figure 1). In a year dominated by realizations of the many ways we are failing our students, it’s time to update our understanding of what it really costs to provide a quality education for every student, as well as ensure that every dollar of ‘at-risk’ funding is spent on services for low-income and academically struggling students. The underfunding of schools has resulted in the redirection of these extra resources towards basic staffing needs. Of the $50 million in ‘at-risk’ funds that is supposed to follow DCPS students to their schools, only 59 percent was allocated to supplemental programming in the initial 2019 school budgets. As a step towards more equitable school funding, the approved FY 2019 budget increases the ‘at-risk’ weight in the school funding formula for the first time since its creation, designating $2 million more for low-income students. Next year, both DCPS and public charter schools will receive $2,387 per student in at-risk funds. The approved budget includes much-needed funds for three critical special education reforms which have been on hold since 2014 due to lack of funding, as well as $10.6 million in new dollars for Out-of-School Time, reversing years of underfunding for afterschool and summer programming. While all of these increases are significant, the budget still fails to fully provide every DC student with equitable supports and an excellent education. Our city needs a better blueprint for the resources required to staff every school and in particular the resources needed to support low-income students. The approved budget does not include funds to commission the recommended update to the Adequacy Study, which could give such a blueprint. The general fund for DCPS now totals $857.9 million, while the total operating budget for public charters now amounts to $889.4 million. In DC, school funding starts with a base amount per student, which is then adjusted upwards depending on the student’s grade and characteristics. Schools receive additional resources for students who are English language learners, special education students, or ‘at-risk’ of academic failure (Table 2). By law, the school funding formula funds both DCPS and public charter school students equally. Increasing the base amount gives schools the flexibility to meet increasing needs. The approved FY 2019 budget increased the base by 3.9 percent, from $10,257 to $10,658 per-student. But the impact of this increase is muted by the fact that school budgets have been too tight for too long. For nearly a decade, increases to school funding did not even keep pace with the rising cost of living. DC’s slowly recovering education budget mirrored school budget cuts in states across the nation. Consequently, it was not until 2018 that schools and teachers had resources to invest in the success of their students on par with what they did nine years earlier (Figure 2). 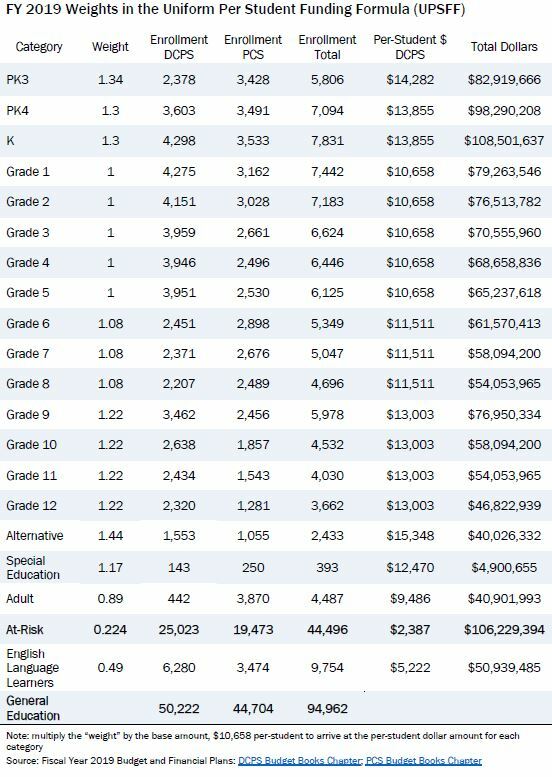 Now in FY 2019, school funding will finally exceed the amount allocated in FY 2009, adjusted for inflation (Table 1). School funding should be tied to what it actually costs to equip every student with a high-quality education. Even with a 3.9 percent increase, the per-pupil funding level is well below this level, based on the 2013 DC Education Adequacy Study commissioned by the DC government. 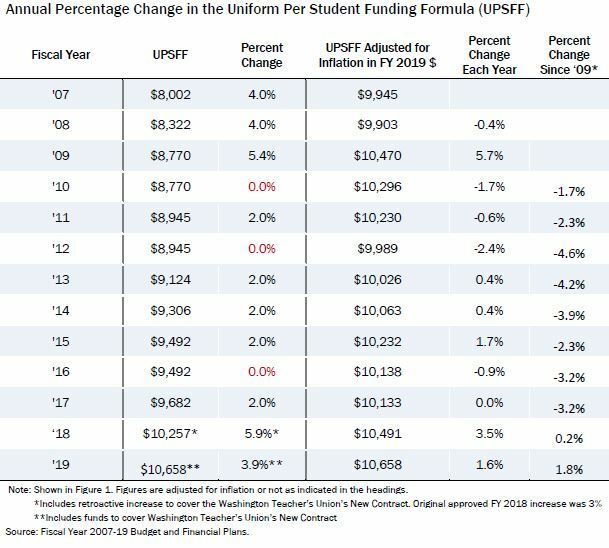 That data-driven analysis, once adjusted for inflation, would require a base rate of $11,600 per-student in FY 2019—almost $1,000 more per-student than the $10,658 allocated. With the recommended base of $11,600, the local education budget would have another $140.4 million to invest in next year’s students. 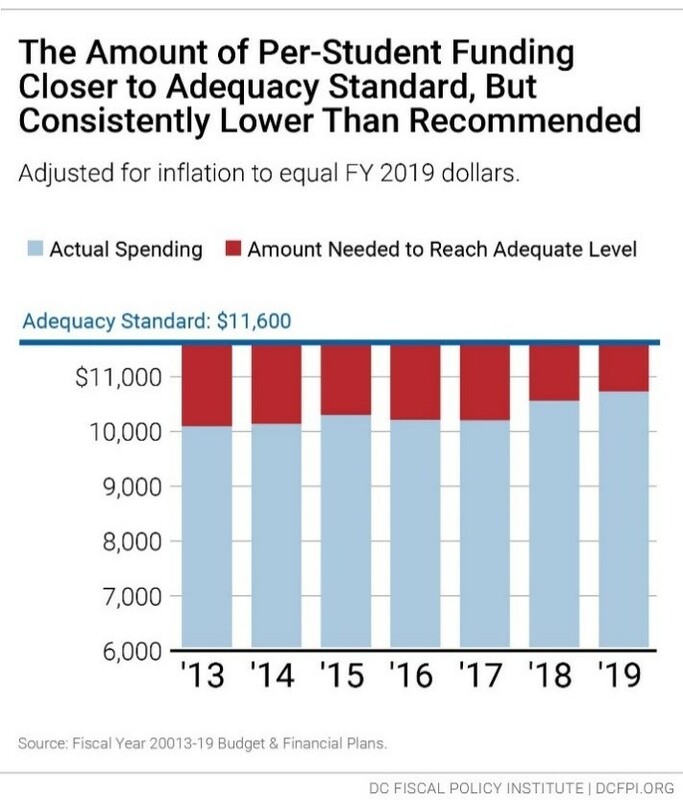 Since the publication of the 2013 DC Education Adequacy Study five years ago, the actual amount budgeted to support DC students has consistently been lower than recommended. In some years the gap has grown rather than shrunk. This year’s increase brings us closer, but we are still $942, or 9 percent, short (see Figure 1). Teachers deserve salaries that keep pace with the rising cost of living in DC. More than 4,000 teachers in the Washington Teachers Union (WTU) went without a contract, or a salary increase for 5 years. This past September teachers received a long-overdue raise: 4 percent for 2017, 3 percent for 2018, and 2 percent for 2019, or 3 percent on average. The WTU contract also pre-determined a floor of $10,447 in per-student funding for the FY 2019 budget. This is because the District committed to raising teacher compensation by 2 percent in FY 2019. Nearly half of the total per-pupil funding increase in FY 2019 was needed to implement the salary increases in the new contract, and help educators manage the rising cost of living. Projected enrollment for FY 2019 is mostly flat compared to budgeted enrollment for FY 2018. A total of 94,925 students are expected to enroll in public schools in the District next year. That’s a net increase of 321 students, all of whom are expected to join public charter schools. For the 2018 school year, the audited number of students enrolled in a DCPS school and supported by UPSFF funds actually declined, after five years of growth (Figure 3). 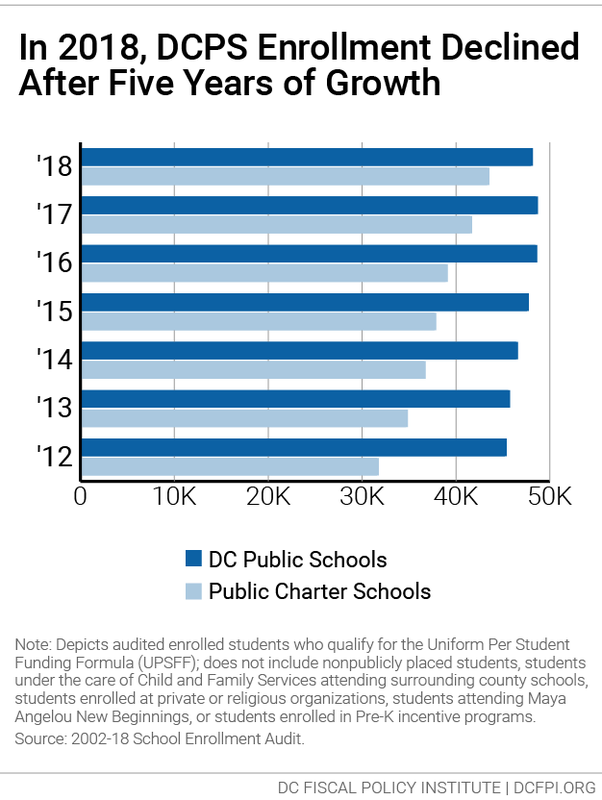 Those declines from 2017 to 2018 were starker for DCPS schools east of the Anacostia river than west of the river. 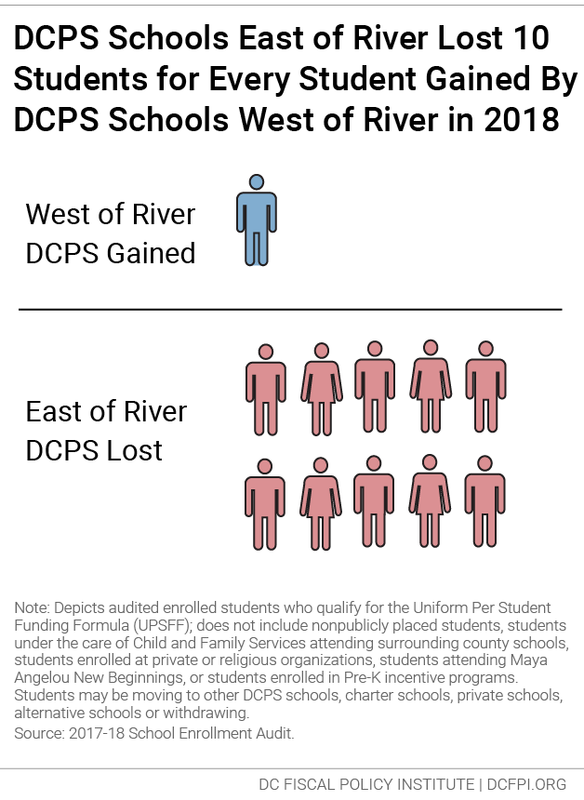 For every student gained at a DCPS school west of the river, DCPS schools east of the river lost ten students (Figure 4). The District needs to invest more in DCPS schools east of the river to ensure students have guaranteed access to a quality school in their neighborhood, particularly since more than half of the city’s students call Wards 7 and 8 home. Both DCPS schools and public charter schools will receive an additional $2,387 per student for low-income students and other students at-risk of falling behind academically in FY 2019. ‘At-risk’ funds are designed to promote equity: to ensure that low-income students get the same kinds of enriching opportunities and services as their higher-income peers, and to ensure that students who are struggling academically get the targeted supports they need to succeed in the classroom. They are supposed to help schools provide supplemental resources and expand important services for the students who need them most. By law, 90 percent ($2,148) of ‘at-risk’ funds must follow the student to their school in DCPS schools. There are distressing differences between the educational outcomes of economically disadvantaged students and their wealthier peers in the District. Less than a quarter of low-income DC high school students are college and career ready in English, according to test scores (Figure 5). Schools are also failing to prepare students of color for college and careers to the same degree as white students. 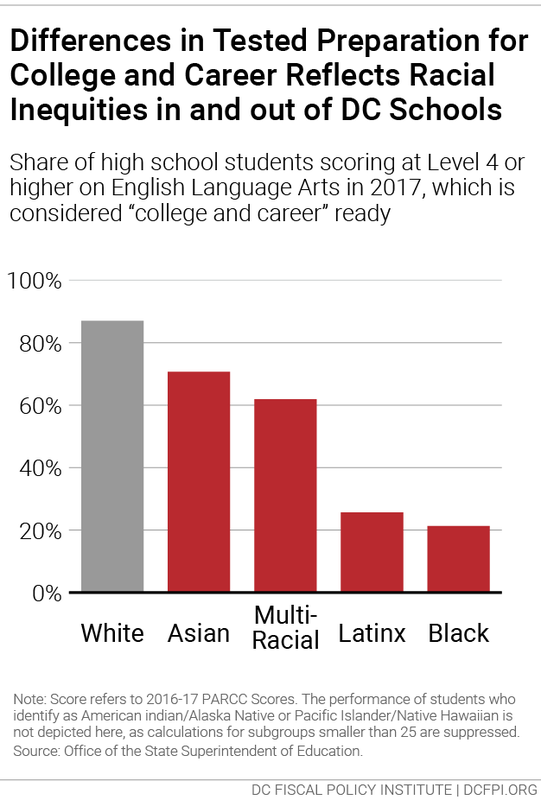 In high school English, 87 percent of white students are considered college and career ready compared to only 21 percent of Black students (Figure 6). Racial disparities in student outcomes are actually widening in the District. Although the PARCC scores of all DC students and subgroups improved overall between 2016 and 2017, the scores of white students improved five percentage points more than Black students. These findings were corroborated by a 2017 study by the DC Auditor. In a study of eight DCPS elementary schools, the Auditor revealed that at least four of the schools used ‘at-risk’ funds to comply with basic staffing standards. Although the Public Charter Schools Board publishes a report on how schools spend their ‘at-risk’ dollars, families often do not have information on how these dollars are budgeted for the next year in real time. In the approved FY 2019 budget, there are $106 million total ‘at-risk’ dollars for both DCPS and public charters to offer specific supports for low-income youth and young people who are struggling academically. It is likely that the problematic funding of core positions with this ‘at-risk’ money will continue. In FY 2019, of the $50 million that was supposed to follow DCPS students to their schools, only 59 percent was allocated in ‘at-risk eligible ways’ ($29.8 million), according to Mary Levy’s latest analysis (Figure 7). This is actually a conservative estimate. 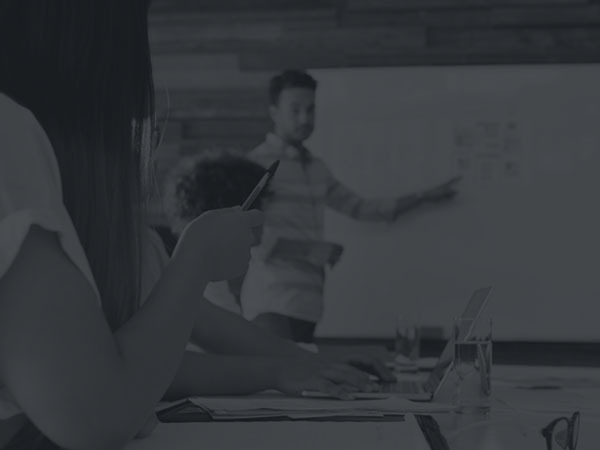 It assumes that ‘at-risk’ funds are being used to support every staff person beyond those positions guaranteed to every school by the Comprehensive Staffing Model, when most schools should also have other pots to draw from, like Title I. Even if every dollar of ‘at-risk’ money in the FY 2019 budget was allocated on targeted services as intended, these funds would remain far short of the levels recommended in the 2013 Adequacy Study. The recommended ‘at-risk’ weight is actually 0.37 – or an addition of 37 percent to base funding – higher than the current 0.224. If the ‘at-risk’ weight were increased as recommended, and all else remained the same, schools would have $69 million more ‘at-risk’ dollars to invest in targeted services for students overall (or $1,556 more per-student). 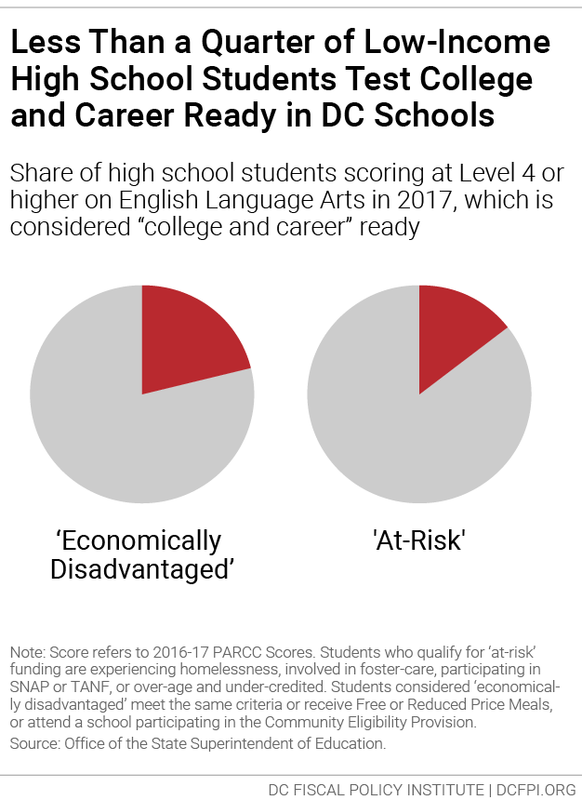 A projected 44,496 students in DC qualify for ‘at-risk’ funding in the 2018-2019 school year because they are a foster care student, experiencing homelessness, overage for their grade, or participate in SNAP or TANF. This means that about half of DC students, in both sectors, are struggling in the classroom or growing up in families working hard to make ends meet. 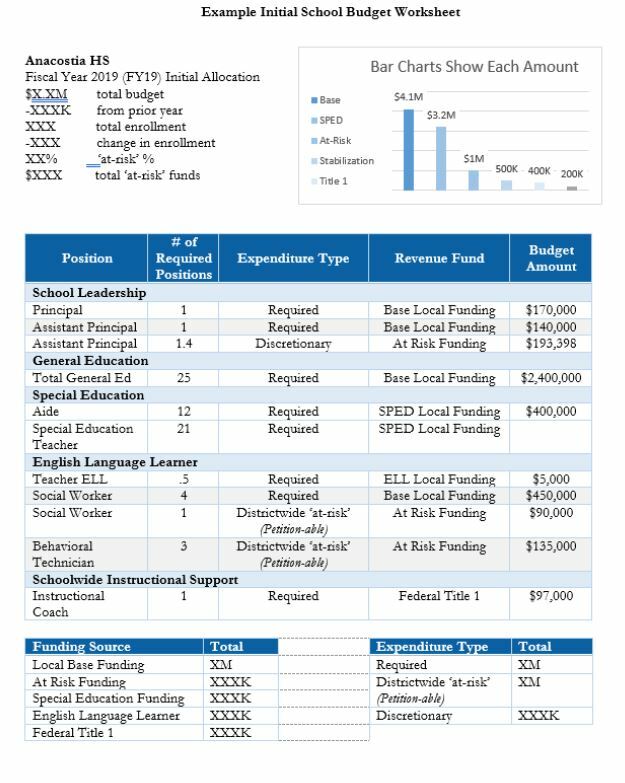 The DC Council took some steps through the FY 2019 budget to improve school budget transparency. Most important, the Mayor is required to submit to DC Council next December the algorithm used to determine the base level amount of per-student funding in the Uniform Per Student Funding Formula for FY 2020. DCPS released a citywide report in September detailing the changes that the FY 2018 funding formula increase were intended to support. But despite this report, it is concerning that a substantial share of ‘at-risk’ funding is budgeted for core staff positions. 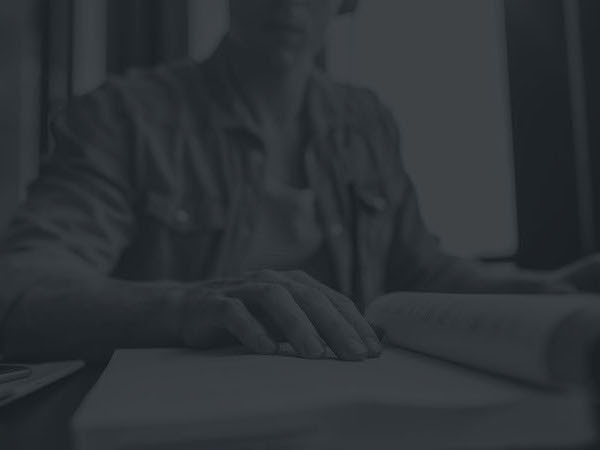 Information on the school level allocation of ‘at-risk’ funds is not made readily accessible in real time, and actual spending of ‘at-risk’ funds is not tracked. To address this, DCPS should add a code to the SOAR financial system to this end, as recommended by education budget expert, Mary Levy. DCPS should work with Council, the CFO, parents, teachers, principals and advocates to present the connection between citywide and school level funding in accessible and understandable ways, and promote meaningful community inclusion in the process. Budgeted expenditures should be clearly connected to revenue sources in Individual School Budget Worksheets (see Appendix A). School level leaders, alongside teachers and families, should be able to leverage ‘at-risk’ funds to serve their students’ specific needs in evidence-based ways. The approved FY 2019 budget includes $10.6 million in new dollars, a $9.4 million increase for the Office of OST Grants and Youth Outcomes, and a $1.2 million increase for the Department of Parks and Recreation. The approved budget allocates a total of $20.3 million for Out-of-School-Time learning in these two agencies. This investment reverses years of underfunding afterschool and summer school programming that have left more children waiting to get into afterschool programs than are currently enrolled. 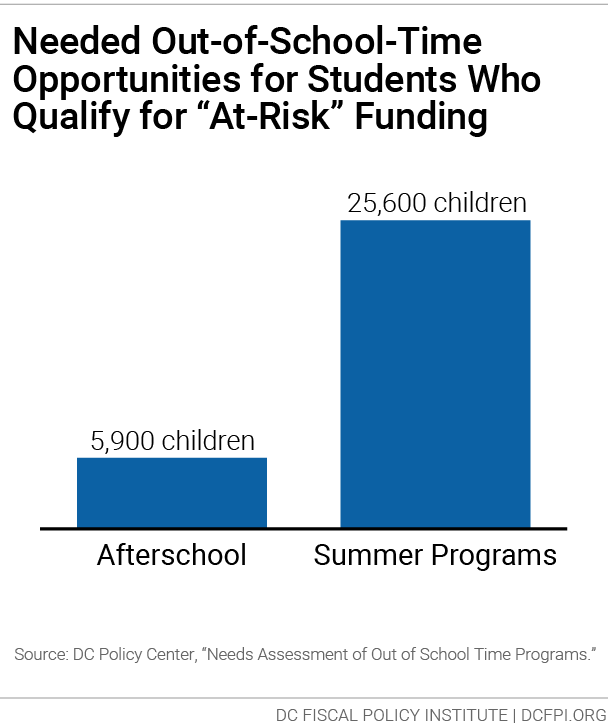 There are about 5,900 students without afterschool options, and 25,600 students without summer opportunities, who qualify for ‘at-risk’ funding (Figure 8). DC leaders should protect and build on this investment going forward to move the District closer to providing the students who need it most with the same kind of enriching out-of-school-time opportunities as their higher-income peers. Future investments should be guided by the Commission on OST Grants and Youth Outcomes that is working to advance better access to quality OST programming across the city. The approved budget funds three critical special education reforms that align services with best practices, which have been on hold since 2014 due to lack of funding: early intervention for more children, faster evaluations, and better transition planning. DC Council should preserve this essential investment. The budget also provides $350,000 to support a teacher preparation program for special education teachers. This long-awaited investment is especially critical, given that students with disabilities and developmental delays are among the least well served by District schools. 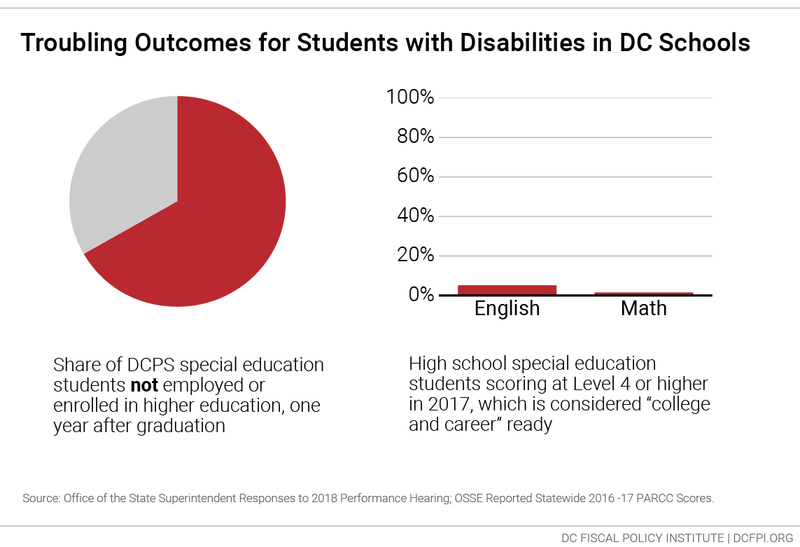 Many special education students in DC do not get the supports they need to succeed, and by high school, fewer than one in ten are college and career ready. One year after graduating or leaving school, two-thirds of youth with disabilities in DC are not in college or working (Figure 9). 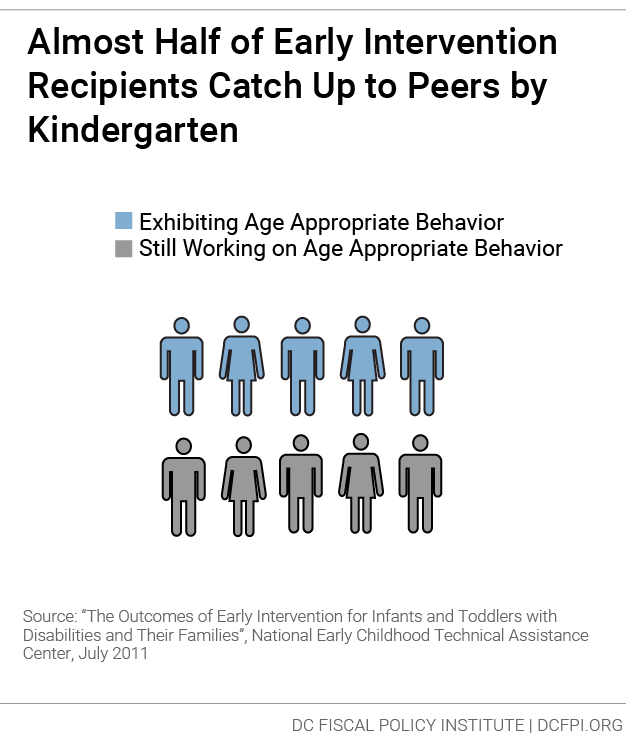 Early Intervention for More Children: Birth to age three is a crucial time for brain and body growth. Yet too many babies and toddlers fall behind because they have unaddressed developmental delays in areas like language or motor skills, especially low-income children. Almost half of children who get early intervention services completely catch up to their peers behaviorally by kindergarten (Figure 10). Starting in July, more toddlers will get back on track. Faster Evaluation: Currently, schools have 120 days to complete evaluations for special education. That means a child can struggle without services for half the school year. The approved budget allocates the funds to halve that and bring it in line with jurisdictions across the country. Faster diagnosis prevents lost learning time for students, and months of stress for their families. The FY 2019 budget includes $3 million to improve and expand services for the Department of Behavioral Health (DBH) School Mental Health Program (SMHP), per the recommendations from the Task Force on School Mental Health. DBH clinicians will continue providing a range of services at their already-assigned schools. Through increased partnership with community-based organizations, SMHP will be further expanded to provide services to the District’s highest need schools. The budget partially funds the recently passed Student Fair Access to School Act with at least $3.3 million for FY 2019 changes. This legislation steers schools away from exclusionary school discipline practices, including out-of-school suspension, which disproportionately hurt students of color and special education students. To support this legislation, the budget invests in the newly established School Safety and Positive School Climate Fund, which includes at least $450,000 new dollars for Restorative Justice Models. Some provisions of the legislation will remain unimplemented until additional funding is allocated in the FY 2020 budget. When schools rely on exclusionary discipline, students miss lessons, fall behind upon return, and are more likely to drop out. When more students are suspended, studies show all students’ academic achievement suffers. 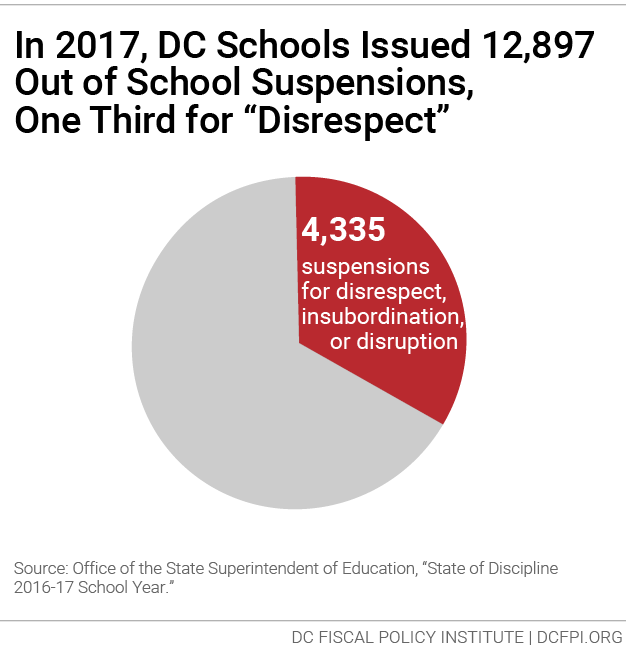 In 2017, DC schools issued 12,897 out of school suspensions to 7,181 students, including 4,335 for “disrespect, insubordination or disruption” (Figure 11). DC also disproportionately suspends the students most in need of support. Students of color, students with disabilities and students in the foster care system are disproportionately suspended and expelled every day. 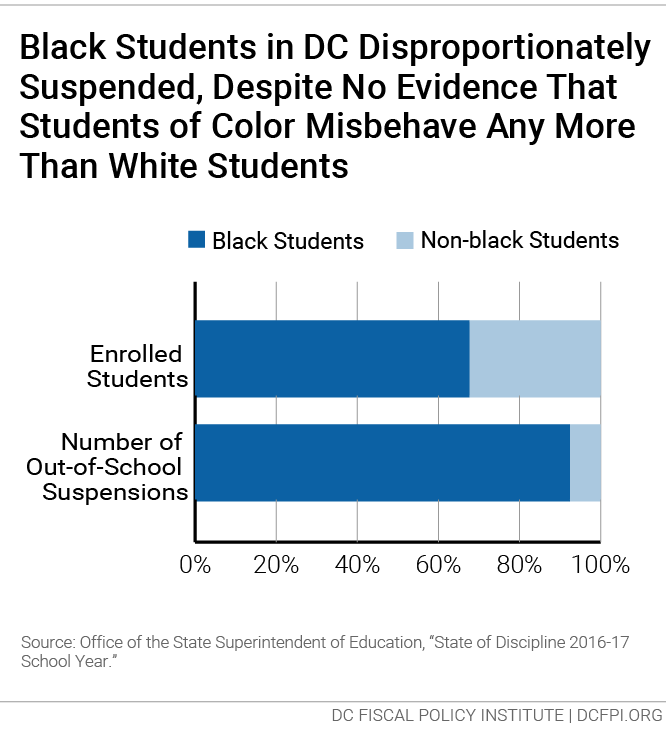 There is no evidence that students of color misbehave any more than white students, yet in DC, Black students are 7.7 times more likely to be suspended and sent out of the classroom than their white peers (Figure 12). This sets Black children up for failure each time they are sent home, as suspended and expelled students are more likely to perform poorly academically, fail classes, and drop out of school. Larger investments are still needed next year to ensure that starting in 2020, no student in elementary or middle school is suspended-out-of-school (except in cases of willful attempts to cause bodily injury or emotional distress to another person). The budget doubled Community Schools funding to a total of $2.8 million. By embracing the Community School model, schools can become better community hubs through partnerships with community-based organizations that connect children and their families with services like health care, afterschool programs, adult education, and early childhood programming. The Community Schools model recognizes that schools are not just centers of academic instruction. They are among our most important and trusted community institutions. Community School partnerships and “integrated student supports” can lead to engaged families, stronger communities, and better academic outcomes. The total funding available for FY 2018 was only $1.4 million. Each applicant could receive up to $177,146 and remain eligible for continued funding for two years. In 2018, OSSE administered $1.4 million in funding to eight grantees at thirteen schools, through the Community Schools Incentive Initiative. The District should make it possible for more interested schools to become vibrant Community Schools, with strong integrated services and partnerships. DC leaders should continue to add more funding to improve current models, expand the pilot, and evaluate the impact of different approaches in the District. Public charter school operators are responsible for leasing or purchasing facilities, as well as improving them. DC government gives charters a facilities allotment per student on top of their instructional budgets to help manage these costs (Figure 13). The non-residential facilities allotment for public charter schools will increase 2 percent to $3,263 per student in the FY 2019 budget. The residential facilities allotment will grow by 3 percent, up to $8,854 per student. Overall, the District will pay $145 million for non-residential charter school facilities, and $4.4 million on residential facilities. 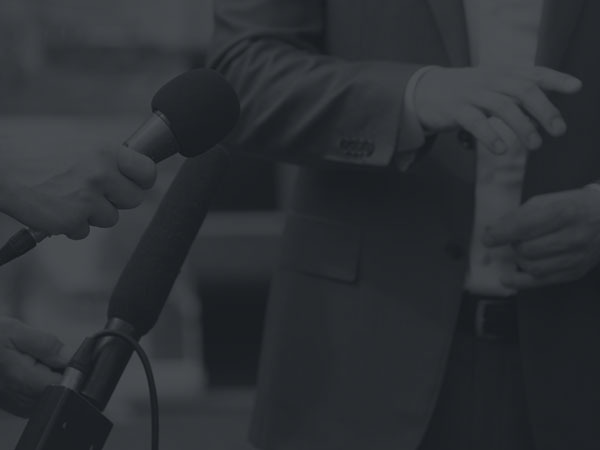 Charter schools are not required to use their facilities allotment on facilities costs. DC Public School buildings are owned and controlled by the District. The school capital budget is largely financed with borrowing through general obligation municipal bonds. The approved FY 2019-24 budget outlines $1.35 billion for 31 DCPS school modernization projects and 16 District-wide projects over the next six fiscal years, including $335 million in FY 2019. 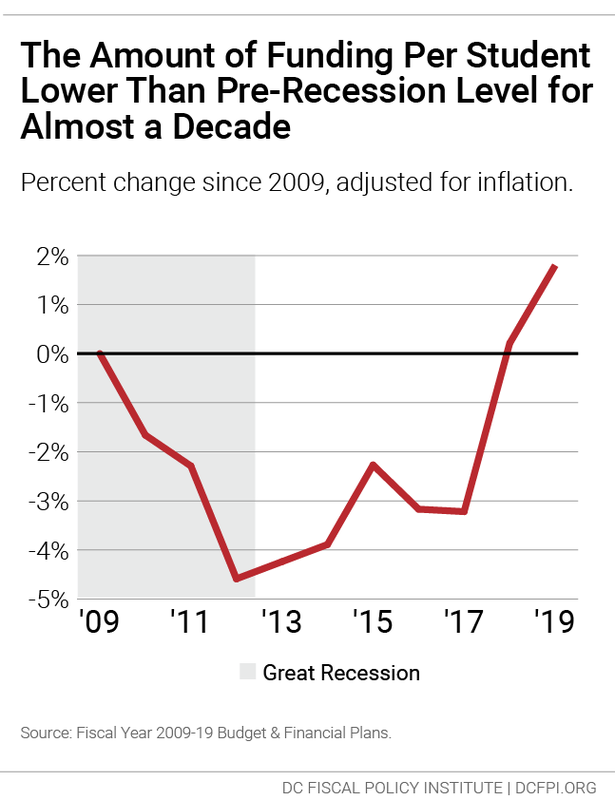 Five years have passed, and yet we still have not reached the level of resources recommended in the 2013 Adequacy Study, once adjusted for inflation – let alone the level needed to keep up with all of our system’s changing needs. 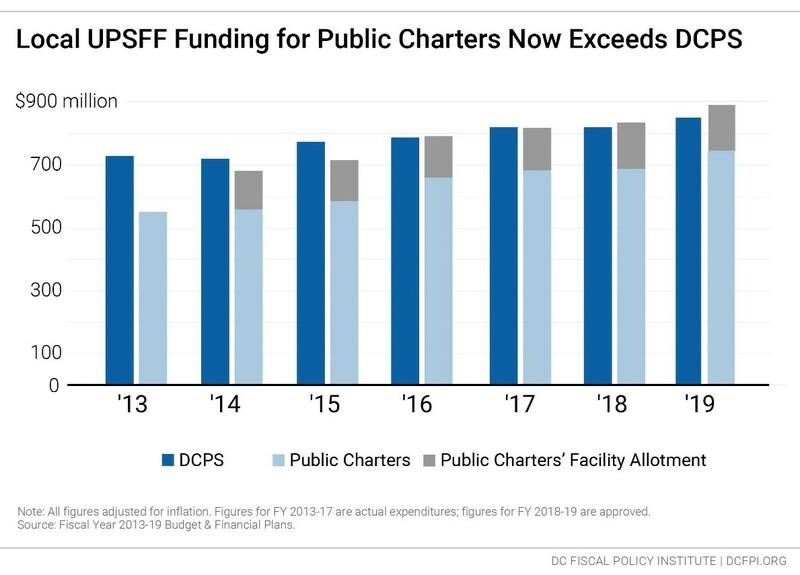 Budget increases for DC public schools and public charter schools in recent years have been arbitrary, and not connected to what’s really needed to provide quality education. We need a better blueprint for the resources required to staff every school and the resources needed to support low-income students in particular. The budget does not include funds to commission the recommended update to the Adequacy Study. DC leaders should revise the 2013 Adequacy Study as soon as possible, with input from both the public and the biennial Technical Working Group. The Special Education Compliance (referred to as Blackman Jones Compliance in some documents) weight was increased from .069 ($9.7 million) to .099 ($13.9 million). This change results in $4,219,608 investment of new dollars in DCPS and PCS local funding to implement these changes. See the Approved Fiscal Year 2019 Budget Support Act of 2018, Title IV, Subtitle A, Section 4002(c), at line 679.